Going racing again is the Bonneville Bullet. "Dyno Dan" Holmes and the Bonneville Bullet will return to the Salt Flats this week in a second effort to become "the world's fastest Indian Bullet." 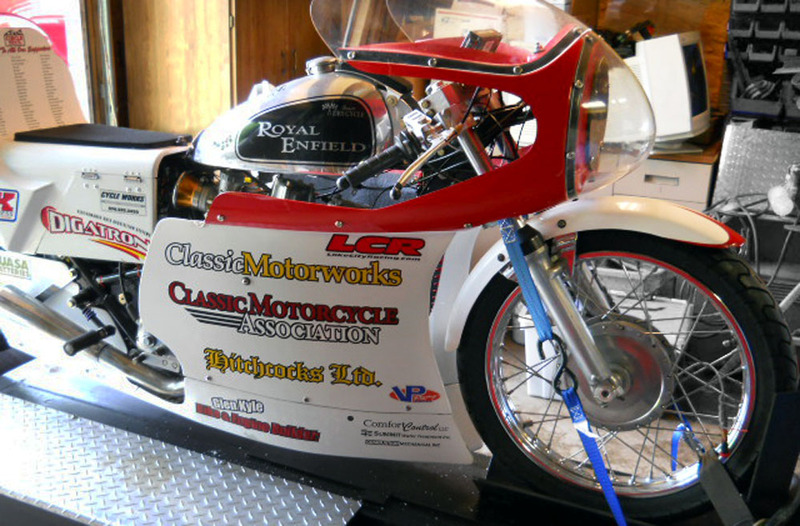 His DRS Cycle team, based in Indiana, will use a partially streamlined 500cc Royal Enfield Bullet with crankshaft and cams by Hitchcocks Motorcycles and "hope to do 120," Dan told the Royal Enfield Yahoo Group on Aug. 3. The Bonneville Bullet will compete both on gas and with a nitrous oxide system (NOS), he wrote. It will use a 22-tooth front sprocket. In 2008 the team set three records with a road racing Bullet it brought along, but the semi-streamlined Bonneville Bullet was sidelined. "Our nemesis last time with this bike was jetting. We were being cautious not to burn it up and were taking baby steps. Anyone who has jetting experience would understand that going down six jets sizes all at once is reckless! We ran out of time as many remember we were on the starting line with the engine running and they closed the track due to a fatality. In any event we are going back and we will make our best effort," Dan wrote the Yahoo group. Dan Holmes, left, with electrical engineer Jim Myers. When you donate, include your name and address in the space provided for a note to Dan. "We will send a autographed photo of the team members and bike on a 8X10 to all donors. I will need them to include a mailing address of course," he wrote me. Aside from money, a volunteer is needed to update the team's website. "Many people claim to have the worlds fastest Bullet, but they increase the displacement and so it is a frivolous claim," Dan wrote. 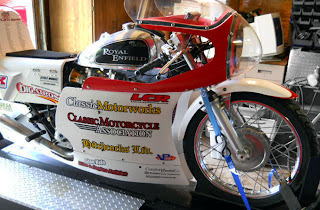 "I am hoping that DRS Cycle will prove to have the worlds fastest (500cc) Indian Bullet!" Holmes was one of the early Royal Enfield dealers when the brand returned to the U.S. in the mid-1990s. His DRS shop in Indiana marketed a "shift kit" that cured some of the ills of the notorious left-side shift bodge on four-speed Royal Enfield motorcycles then being sold in the United States. "My son Nathan who was a big help with the road racer is accompanying me, as Phil is unable to attend this year due to work scheduling. Nathan actually owns the road racer and it is on display in the Hostetler's Hudson Museum in Shipshewana, Ind. My oldest son Jason will inherit the Bonneville bike when we retire it. Both bikes will likely end up at the museum, however the partial streamliner may see more service if there is anything useful left after Bonneville!"